Albuquerque, NM, September 30, 2012 – After her third 30 Funerals in 30 Days Challenge, death educator Gail Rubin found memorial services increasingly incorporate technology, including QR codes, and religion continues to be an important element. The services were selected out of the local newspaper obituaries, or by direct invitation. Family permission was obtained prior to each service. This year, only one family requested the story about the deceased not be told. In the previous two years, one family per year made the same request. As technology becomes more integrated into services with music and video tributes, funeral homes and their clients need to coordinate on AV formatting. At several services there were glitches due to incompatible media. QR codes on prayer cards and memorial folders offer an innovative way for family and friends to access online memorial guest books and tribute videos through smart phone technology and YouTube. Memorial services are taking place in settings other than funeral homes, cemeteries and houses of worship: assisted living facilities, nursing homes and at private homes – wherever the deceased or their close family members lived. In some cases, obituaries in the newspaper are as short as possible, directing readers to the funeral home’s website for service information and more about the person. This is utilized to save money on the per-line fees the newspaper charges. A growing number of obituaries indicate there will be no service, or the service is listed as a private event. The services honored 20 men and 10 women. There were 11 funerals with the body present and 22 services with cremated remains or no remains. One funeral was followed by cremation and a rental casket was used. One funeral took place in Mexico and the service in Albuquerque was a memorial service. One funeral was webcast live around the world from Korea. Religions for the services included Catholic, Anglican, Latter Day Saints (Mormon), Unitarian Universalist, Seventh Day Adventist, Jewish, Evangelical Christian, Church of Christ, Buddhist and Unification Church. Of the 30 memorial event postings, 11 were non-religious or made only passing reference to religion or spirituality. Causes of death: Cancer (8), age-related illnesses (8), organ failure (4), accidents (3), Alzheimers (3), heart attack (2), suicide (2). Out of the 30 events covered, only about six people had planned their funerals in advance – four were women. “Amazing Grace” was sung at nine events, the 23rd Psalm recited at five. “My thanks to the families who allowed me to cover the services for their loved ones. I hope these stories will help them remember and continue to celebrate the lives they lived,” said Rubin. Rubin’s 30 Funerals in 30 Days Challenge was chronicled in an Albuquerque Journal front-page story on September 9. Read Leslie Linthicum’s column online. 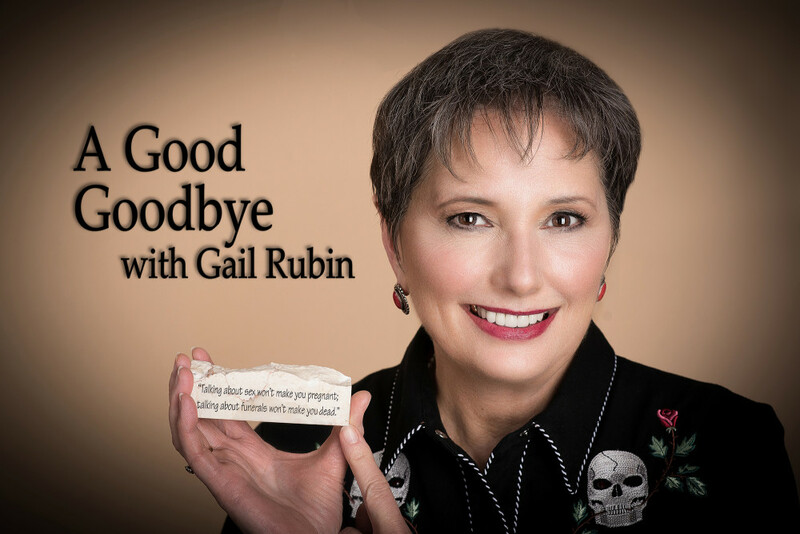 Gail Rubin is the author of the award-winning book A Good Goodbye: Funeral Planning for Those Who Don’t Plan to Die. She’s also a speaker and death educator who uses funny films to help start serious funeral planning conversations. Learn more at www.AGoodGoodbye.com.